Designed by the Canadian duo of Neil Haworth and Stéphane Talbot, the course at PalmGolf Ourika is situated to the south of Marrakech, close to the snowy peaks of the Atlas Mountains, and it first opened for public play in the late summer of 2015. The course measures a mammoth 6,692 metres from the back tees, with holes routed around a 180-acre residential site. Wide, generously proportioned fairways are bounded mainly by large, sandy waste areas, affording the layout a desert ambience – though six lakes also come into play during the round. Constructed by the Palmeraie Development Group and operated by Troon Golf, this plush new 18-hole operation is the perfect complement to the 27-hole Robert Trent Jones Snr-designed sister venue at Palmeraie on the other side of Marrakech. The greens were built with Penn A-1 Bent grass and Riviera Bermuda was used for tees and fairways. There are full concrete paths throughout as it’s the first cart-only golf club in Morocco, and each buggy is equipped with a global positioning system to assist golfers with their club selection and strategy. I played Ourika on a perfect late September morning, still and cloudless. As other reviewers have noted the challenge from the tee is carrying waste areas and water, choose the correct tee carefully and the generous fairways with minimal tough should prevent you finding too much trouble. I thought the best holes were the par 5's, only the bravest and best will go for them in two with the rest of us having a short iron into a smalllish target and plenty of trouble for wayward shots. The greens were excellent, fast and true with plenty of subtle breaks and bumps to savour. Overall condition was great although the views weren't enhanced by lots of half built and seemningly abandoned villas around the back 9. It's not a course for walking, not sure buggies are mandatory but it would be long not walk otherwise with the distance between some holes. I would make sure you arrange transport before hand, it's a long way from the centre or you'll have a long wait for a taxi back! Palm Golf OURIKA Marrakech. Ranked 8th in Morocco; six lakes and cart only course. The Atlas mountain backdrop creates a good surround although also bounded by quality properties built well back from the course where there is lots of freedom. In great condition the day we played it so we came back again and it did not disappoint. With lots of space it is a hitter’s course where you need to carry the water or the waste. As you get used to working the GPS on the mandatory cart this is not a problem, if your game is on. The back nine are made up of 3par 3’s, 3 par 4’s and 3 par 5’s-- apparently a Seve B. recommendation for good course design. The greens were fast and in pristine condition and large enough to reach in regulation. Take your time on the greens to enjoy calculating the subtlety of the breaks. Pity the front, middle, back flags were not in use. Favourite was index 1 fifth par four and 10th par five circling a large pond. One of the table top par3’s were a bit much like the 17th. The cart comes with your own rake and you will need it as sand abounds. Would rank it top of all played in Morocco to date and ahead of Tazegzout except for the scenery. Well signed and a good practice area. There were no local rules on the back of the card so we just played golf! Unforgettable, most enjoyable, twice; Ranks #1 for us. - Feb ’17. 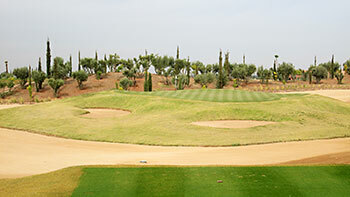 Such is the speed at which new golf courses are unveiled in Marrakech these days, I was literally making final preparations in the days before my visit to Morocco when I received email notification that yet another new 18-hole layout - PalmGolf Ourika - had just opened to the south of the Red City. It’s a course that’s been built on a grand scale, though judicious selection of tee position makes it eminently playable for golfers of all handicaps, because there’s five sets of tees on every hole. I’d been warned the day before visiting that it “was too difficult for average players” but, with the greatest of respect, I’d suggest that such a comment is only true if golfers with a higher handicap choose to play from the back tees – and that bit of golfing wisdom applies anywhere, of course! Nonetheless, it’ll be interesting to see what SSS/slope is assigned to the course, once it’s been open for a while, to see if it’s really as tough as some think it is. I thought in advance that I’d hate the huge waste areas but they work really well, adding greatly to the character of the layout. Fairways are generally wide and forgiving – except for a few pinch points around water hazards – so you really have to be wayward to not find a grassy lie. The large putting surfaces were beautifully contoured and, even though there were greenside sand traps on many of the holes, I was pleased to see that greens were not always tightly bunkered, allowing recovery shots to be played from grassy swales when a misdirected approach shot had been played. There’s a cluster of strong holes on each nine, the 4th to the 6th on the front and holes 13 to 15 on the back. The 8th and 17th are very interesting, sitting side by side, separated by a large waste area dotted with palm trees. The former, a long par three measuring 200 metres from the back markers is a real beast and the latter – which must be considered the “signature hole” – is a 150-metre short par three with its green completely surrounded by the waste area that divides the two holes. Incidentally, one of the more surreal sights on the course occurs at the short par four 11th, where you’ll see cable skiers whizz round the lake adjacent to the tee. I suppose after checking out the ice bar on top of The Montgomerie clubhouse, nothing should surprise me anymore at golf clubs in Marrakech. On the other hand, what might surprise a few people is the quality of golf on offer at this place as it’s a far superior golf product to the one currently on offer at its partner establishment, the older Palmeraie site on the other side of town. Definitely one of the best new tracks to emerge around the Red City in recent times. Jim's review is spot on. Great combination of risk/reward tee shots to carry large waste areas or water. Greens have slope but not a lot on undulation so opportunities to make putts on the firm and true surfaces abound. Surface conditions in general are supurb. Choose the tee colour best suited to your game and you will have an enjoyable go.Highly recommend.